After an Author’s post passes validation, it is added to a list of posts to be checked by Editors. Editors can fix and approve posts, send them back to the Author, or forward the post to an Administrator. When a post is sent back to the Author, the Author should fix it and resubmit it. It will then be checked by a second Editor. The second Editor must fix and approve the post – there is no third pass. Because more editing is required, Authors are paid less for posts that go through two passes. Editors should familiarize themselves with all the major errors (list coming soon). 1. Select a post from the Approve Posts list. Go to Posts > Approve Posts. Choose any post to edit. The name and author of the post have been anonymized and cannot be seen before selection. This is to stop editors editing their friends’ posts, and also to stop any kind of favoritism or harassment. Select the Perfect Post checkbox. The Author receives a bonus contribution credit of 0.10 for creating the post and they receive the Perfect Post badge. Please double check when selecting this option, as there are often minor errors. Select the checkboxes that match the errors. For example, if there are minor spelling issues, please select the “minor spelling” checkbox. Multiple minor errors can be selected. The selections give the writer important feedback about their post quality, and contribute to their post statistics. Editors can also leave notes for the Author in the comment box. The Editor should fix minor errors in the text and publish the post. Editors get a contribution credit of 0.25 for checking the post and a bonus of 0.10 for fixing the post. The Author and Editor are credited for payment upon publication. Select the checkboxes that match the errors. Major errors are marked in red. 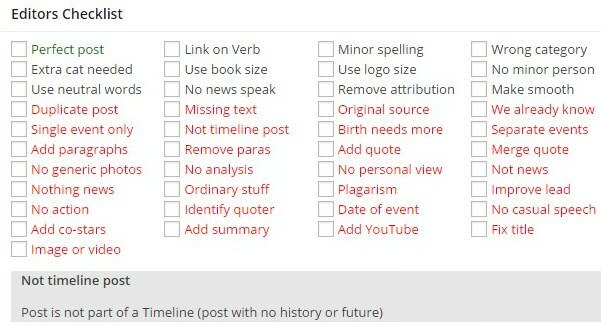 For example, if the post should have a quote, please check “add quote” checkbox. 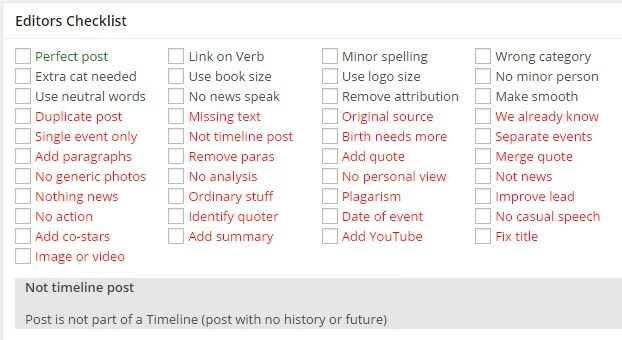 Multiple checkboxes can be selected. Editors can also leave notes for the Author in the comment box. The post is then returned to the Author by clicking the “Return to Author” button. The Editor receives a contribution credit of 0.25 for checking the post, which is credited immediately. The Author must wait until the post is published for their credit to go through. The post will be returned to the Author, who should fix it and resubmit the post. A second Editor will review the post and must fix and publish the post. When the post is published after a second pass the second Editor will receive 0.25 but the writer’s credit will drop to 0.85. Posts that include spam, abuse, harassment, or other situations beyond the scope of the normal editing process can be forwarded to an Administrator, who may contact the Author and Editor directly.